MONO-GREEN HAS PLENTY OF CARD ADVANTAGE. MONO BLUE ISN'T BETTER FOR CARD ADVANTAGE. BOROS LACKS CARD ADVANTAGE. MONO-GREEN LACKS REMOVAL. DO NOT CONFUSE THIS WITH CARD ADVANTAGE LOSS. Okay, now with that taken care of, lets get to the deck. First off, we have 4x Arbor Elf : Arbor Elf is the best ramp in the format with Utopia Sprawl . Makes this deck able to run 22 or so lands with the chance of 4 mana turn 2. Solid Card. 4x Utopia Sprawl . Great card (See above for reasons), Anyway, Always name green. 2x Beast Within : Quote from above: ...MONO-GREEN LACKS REMOVAL... . 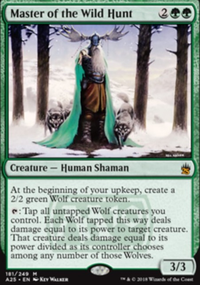 Beast Within is notably a removal spell, IN GREEN. 2-of catch all, very nice to target something bigger then a 3/3 beast token. 3x Courser of Kruphix : On first look, gains life, benefits green ramp strategies. Opon CLOSER INSPECTION, IT PROVIDES CARD ADVANTAGE AND LIFE-GAIN. Much better here then Tireless Tracker , as you don't lose mana, and life-gain is better here then one big creature. 4x Ancient Stirrings : Don't you dare ban Stirrings, WoTC Finds lands & helpful artifacts to further your lock(s). Absolutely a 4-of. 1x Scavegig ooze: Maindeck Grave-Hate, Lifegain, and sigh a big creature all in one. Leave it to a ooze to be this formless. Only one-of though. 1x Llanowar Elves : Needed extra ramp, my curve was to high. Took out a Balista. 2x Nissa, Voice of Zendikar : Swarm/Chump, buff, and Card Advantage & Lifegain. Worth a include. 2x Inkmoth Nexus : Solid land, can win games, especially against control. Only two-of, as it interferes with both Arbor Elf and Utopia Sprawl . IT IS FULLY REPLACEABLE WITH Blinkmoth Nexus IN THE MAYBEBOARD. Well, here's the more important, more expensive part of the deck. 4x Master of the Wild Hunt . DO NOT CONFUSE WITH Master of the Hunt Two things stand out: 1, That's a lot of Wolves. 2, TRAINED WOLVES! Green removal! Swarm! Very great! This was featured as the card of this deck for a reason. Also, 3rd thing: Killer Art. 4x Garruk Relentless ! Wow, he makes more wolves, big deal. But his 0 is removal! And he can Make 1/1 Deathtouch Wolves Which are traditionally better assassins when combined with you local Master of the Wild Hunt then store brand 2/2s. His -1 tutors up that needed Singleton Scooze, and his -3 is a Overrun . Drawing multiples isn't a problem either! He conveniently transforms (at will) so that nasty Legend rule doesn't apply. His other 0 ability is decent, because who ever said no to a new 2/2 Puppy? He is perfectly fine as a 4-mana creature targeting Lightning Bolt . (Hey it's better then Hornet Sting .) He also is perfectly fine as a 2/2 chump factory. 4x Ensnaring Bridge : This is the perfect way to make up for removal loss, it is synergistic with Ulting Nissa. It is a very good card. How do I Mono Green?